The kitchen is one of the easiest places in the home to incorporate color. From a bright cheery kettle on the stovetop to pop-color tea towels, it doesn’t take a lot of money or effort to brighten your kitchen. And fortunately, there are a wide variety of colorful brands specializing in cookware, tabletop, appliances and decor. Of all the brands I’ve seen, however, I think these five are the best resources for iconic, playful, cheerful and colorful kitchen-gear. Fiesta, or Fiestaware is a line of ceramic dishes that has been manufactured since the 1930s. It has cool art deco styling and is beloved by collectors, who troll thrift stores and flea markets for vintage sets of these colorful dishes. It was revolutionary at the time for it’s bold colorful glazes and “open stock” concept, wherein a consumer can mix and match whichever pieces and colors they desire. It was a far cry from the prim china sets inspired by the Victorian era that were popular at the time. Mass production and marketing eventually led it to become “the most collected brand of china in the United States,” according to the New York Times. Le Creuset is a French brand of cast iron and enamel cookware. It’s been produced in the town of Fresnoy-le-Grand since 1925. They are known for their colorful enamel exteriors, which are perfected by a 12-step process. Their signature color “flame”, a bright red-orange shown below, was modeled after the color of the molten iron used to make the cookware. There are currently 22 cast-iron colors in production. KitchenAid is an American appliance brand that was founded in 1919. They are most famous for their stand mixers, that come in an array of brilliant colors and finishes. 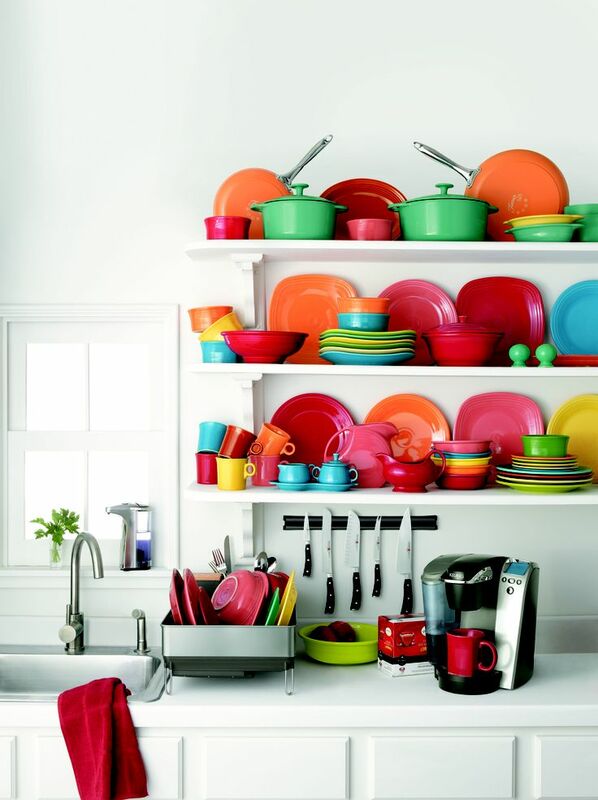 They also make a range of kitchen appliances and tools that come in coordinating colors. The iconic stand mixer hasn’t changed much since the 1930s, when the model “K” was introduced. In fact, it’s possible to use mixer attachments from generations all the way back to the 1930s. It’s a bit of an investment to own a KitchenAid stand mixer, as they start at $249, but if you’re a dedicated cook that loves color, it’s a worthwhile investment. Smeg is an Italian appliance brand that is known for its colorful, retro aesthetic. They are one of the only appliance manufacturers that offer large appliances like refrigerators and dishwashers in fashion colors, like orange or pink. They also now offer small domestic appliances with the same colorful retro look. Anthropologie is a great source for colorful boho kitchen decor and tabletop accessories. Their products have a creative, quirky and often boho look, and mix and match well. They have especially colorful and beautiful dinnerware and soft accessories, like aprons, tea towels and table linens. Kate Spade’s kitchen line “All in Good Taste” was launched to great fanfare just a few years ago, right after I joined the company. And they have been serving up clever, colorful and delightfully unexpected designs ever since. While their soft accessories come in a variety of prints and colors, their cookware comes in three color choices: Kate Spade green, aqua and orange-red. Dishes run the gamut from elegant to everyday, and often feature a bold pop of color. It’s a cheerful product line that makes cooking and entertaining fun and playful. Benjamin Moore's 2018 Color of the Year: Caliente!